Amethyst is a semi precious gemstone that Navneet Gems produces in a regular basis for customers worldwide, mostly jewelry manufacturers. Contact us today for any requirements in Wholesale Amethyst with a minimum of $1,000 per order, in any size or shape for amethyst; African Amethyst and Brazil amethyst mostly, but not ignoring the possibility of the use of Uruguay amethyst and Six corner. Finding a good competitive source in Amethyst is very important. Jaipur and Bangkok used to be the big hubs of Amethyst few years ago and they still are, but situation’s have changed. Amethyst has been pressured more and more on quality and price. In this situation only the manufacturers of Bulk Amethyst who understand the stone since its birth, can survive. 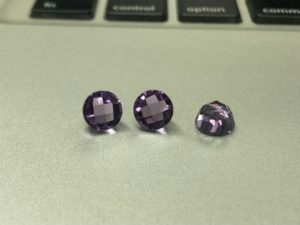 If you are looking for custom cuts, sizes, shapes or any standard items in any of the Amethyst colors, this is the place to start your sourcing! START SOURCING YOUR WHOLESALE AMETHYST NOW DIRECTLY FROM THE MANUFACTURER.